Alfred W. McCoy of the University of Wisconsin-Madison systematically dismantles the rationale for torture (or "alternative procedures," to use the euphemism that President Bush adopted in a recent speech) in an article entitled "The Myth of the Ticking Time Bomb." I highly recommend it. A good question, certainly, but so is this one that Dorfman also asks: "Are we so fearful, so in love with our own security and steeped in our own pain, that we are really willing to let people be tortured in the name of America?" G. John Ikenberry has an explanation for the world's dislike of American foreign policy that goes beyond the miscues of the Bush administration. There's a short version of his thesis and a long version. In comments here, PW points to an op-ed by Peggy Noonan from the Wall Street Journal. Noonan rightly criticizes the over-heated rhetoric (hellish rhetoric might be a better term post-Chavez) that seems to be circling the globe these days. It's almost as if Kim Jong-il had become the avatar of diplomatic discourse. U.N. speeches are, by history and tradition, boring. You daydream to them. This is not all accident, not only the result of the fact that a nation's diplomats don't usually come from the more scintillating parts of its elites. (They rose to the U.N. in the first place because they didn't fatally offend anyone back home.) Their speeches are dull because they know divisions can be dodged or blunted by a heartening vagueness. And so their words are blankets, not bullets; meant to envelop, not pierce. Noonan obviously didn't have John Bolton in mind when she wrote that UN representatives "rose to the U.N. in the first place because they didn't fatally offend anyone back home"--unless she meant the term "fatally" to be taken with great literalness. But I digress. Many others have made similar observations about the language of diplomacy. Isaac Goldberg said, "Diplomacy is to do and say / The nastiest things in the nicest way." Caskie Stinnett, in a 1960 book entitled Out of the Red, defined a diplomat as "a person who can tell you to go to hell in such a way that you actually look forward to the trip." Traditionally, diplomats have tried to keep their discourse diplomatic even when the policies they are defending have not been. Otto von Bismarck noted that "even in a declaration of war one observes the rules of politeness." As Noonan points out, "Harsh words inspire the unstable." But Noonan fails to recognize that George W. Bush has based his presidency on harsh words and simplistic categories. We could certainly use more of the bland language of diplomacy--at the UN and elsewhere--and a good place to start might be in convincing the president of the United States to consider the impact of his words on foreign audiences. The ellipsis obscures an important qualification. Earlier this week, General John Abizaid, head of the U.S. Central Command, was asked if the United States is winning the war in Iraq. He replied, "Given unlimited time and unlimited support, we're winning the war." Peggy McGuinness at Opinio Juris performs a great public service by posting a clip of Ali G's visit to the United Nations. Ali G asks, "War. What is it good for?" He also interviews former Secretary General Boutros Boutros Boutros-Ghali. 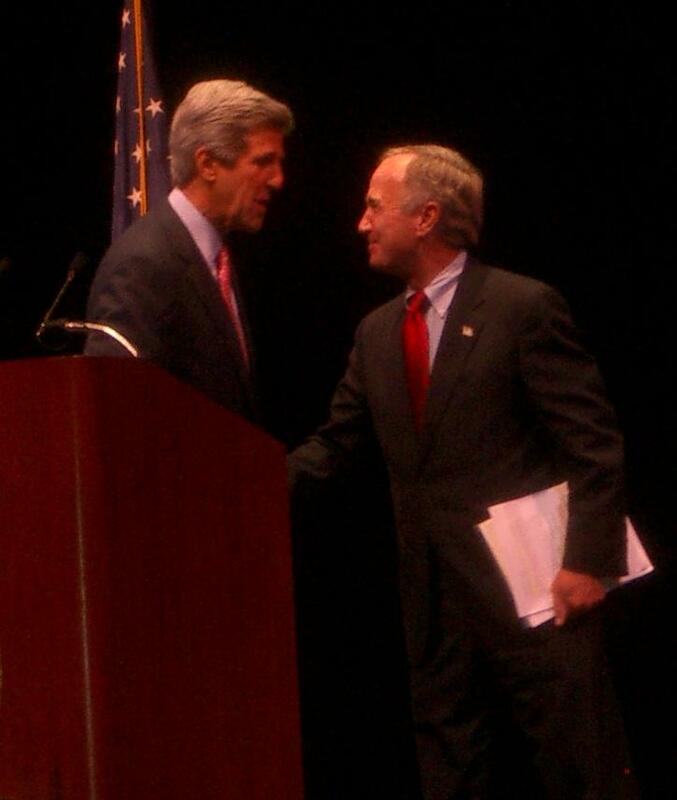 A video of Senator Kerry's speech at Pepperdine is available here. Hugo Chavez yesterday gave the most entertaining--and undiplomatic--address so far in the 61st General Assembly's general debate. It was also apparently the most vigorously applauded. While the UN website that provides links to video and text for all of the speeches to date curiously says "text not available" next to the listing for President Chavez, the New York Times offers a summary and a few choice quotes. According to Helene Cooper's story, applause for Chavez "lasted so long that the organization’s officials had to tell the cheering group to cut it out." The devil came here yesterday, right here. It smells of sulfur still today, this table that I am now standing in front of. Sticks and stones, W, sticks and stones. During the speech, Chavez held up a copy of Hegemony or Survival: America’s Quest for Global Dominance by Noam Chomsky and recommended it to his audience. (And I thought my product placement ad for Seeking Security in an Insecure World during yesterday's Founder's Day Convocation at Pepperdine was good.) Later, according to the Times, at a news conference, "He suggested that Americans read Mr. Chomsky’s book instead of spending all their time 'watching Superman and Batman' movies." That, Mr. Chavez, is going a bit too far. Dan Caldwell introduces Sen. Kerry at Pepperdine on Monday. Senator John Kerry gave a major address on the intersection of faith and politics at Pepperdine University on Monday. As Washington Post writer Alan Cooperman noted, the 2004 Democratic presidential nominee "described his religious life in greater candor and detail than ever before." Especially poignant was Senator Kerry's description of the impact that his service in Vietnam had on his faith. For me, war was a difficult place for faith to grow. Some of my closest friends were killed. I saw things that disturb me to this day. Theologians often talk about "the problem of evil," the difficulty of explaining why terrible and senseless events are part of God's plan. In combat, you confront the problem of evil in an up-front and personal way that is hard for others to fully understand. Senator Kerry urged people of faith to find common ground in efforts to address poverty, care for Creation, reduce the need for abortions, and apply religious insights to the problem of war. He especially urged renewed attention to the principles articulated in the Christian just war tradition. It's in America's interest to maintain our unquestionable moral authority--and we risk losing it when leaders make excuses for the abuses at Abu Ghraib and Guantanamo or when an Administration lobbies for torture. sometimes a President has to use force to fight an enemy bent on using weapons of mass destruction to slaughter innocents. But no President should ever go to war because they want to--you go to war only because you have to. The words "last resort" have to mean something. In Iraq, those words were rendered hollow. It was wrong to prosecute the war without careful diplomacy that assembled a real coalition. Wrong to prosecute war without a plan to win the peace and avoid the chaos of looting in Baghdad and streets full of raw sewage. Wrong to prosecute a war without considering the violence it would unleash and what it would do to the lives of innocent people who would be in danger. And for all the anger and fear so often expressed about the intersection of politics and religion, I believe that a vision of public service based upon serving rather than being served is ultimately a vision of hope and not despair. The Scripture says, again and again, "be not afraid." God is not through with humanity. Shame on us if we use our faith to divide and alienate people from one another or if we draft God into partisan service. Shame on us if we sow fear for our own advantage. As God gives us the ability to see, let us take up the tasks associated with loving our neighbors as ourselves. We can take up God's work as our own. The call of Jesus, and of every great religious leader, to everyone is one of service to all and not the pursuit of power. Each of us needs to do our best to answer that call, and help each other hear it in a common spirit of obedience, humility and love. For the complete text of the speech, go here. Oh, and for the record, the overflow crowd in Smothers Theater gave Senator Kerry a standing ovation. Mea culpa. Colin Powell, contrary to my assertion here, was correct in referring to Gen. George C. Marshall as the Secretary of Defense. As Joe Biles noted in a comment on my post, Gen. Marshall served as secretary of defense after his stint as President Truman's secretary of state. I should have known better than to question a former secretary of state and former chairman of the Joint Chiefs of Staff on that point. While we're at it, it might be worth noting that Marshall was SecDef #3 under President Truman. Truman, the first to have a secretary of defense (following the major defense reorganization that occurred in 1947), appointed four before he was through. That remains the record for most secretaries of defense in a single presidential administration. The record for the fewest number of secretaries of defense in a single administration is, of course, one. George W. Bush is the longest-serving president never to have changed his secretary of defense. (John F. Kennedy, Gerald Ford, Jimmy Carter, and George H. W. Bush are the other presidents to have had only one SecDef.) Robert S. McNamara, who served under JFK and LBJ from January 21, 1961 to February 29, 1968, is still the longest-serving secretary of defense. Donald H. Rumsfeld will, if he makes it, break McNamara's record sometime in late December of this year by virtue of having served for a year and two months under Gerald Ford. I'm glad we got that cleared up. President Bush addressed the United Nations General Assembly at the opening of its 61st Session today. The text of his remarks is available from the White House website and also from the UNGA website [.pdf file]. The President spoke fourth during the morning session following UN Secretary-General Kofi Annan, President of the General Assembly Sheikha Haya Rashed Al Khalifa, and Brazil's President Luiz Inácio Lula da Silva. Secretary-General Annan's opening address to the UNGA was his last in the post. In all, twenty-seven heads of state or government spoke before the UNGA today. Dahlia Lithwick has a must-read essay in Slate for those who don't already know why the definition of torture we enshrine in law matters a great deal. The world is beginning to doubt the moral basis of our fight against terrorism. To redefine Common Article 3 would add to those doubts. Furthermore, it would put our own troops at risk. In the letter, Secretary Powell errs in stating that Gen. George C. Marshall served as Secretary of Defense after World War II. In fact, he served as Secretary of State. This factual error, however, takes nothing away from the force of Secretary Powell's argument against the Bush administration's position on Common Article 3. On this date in 1821, Guatemala, El Salvador, Nicaragua, Honduras, and Costa Rica declared their independence from Spain. Years ago, the State of Texas promoted tourism in the state with a slogan that proclaimed, "Texas: It's like a whole other country." On that basis, perhaps I can justify writing a few words here on this IR blog about the passing of Governor Ann Richards. In 1990, Richards became only the second woman to hold the highest office in the Lone Star State. (She was preceded by Miriam A. "Ma" Ferguson, who was elected governor after husband, James A. Ferguson was impeached. She campaigned on the slogan, "Two governors for the price of one." Critics said, "Bedfellows make for strange politics.") She was a rare breed--a progressive Texas Democrat able to win a statewide election. It is, today, an extinct breed. If for no other reason (and I would argue that there were many other reasons), Richards was good for Texas--and for humankind--because she brought more women and minorities into positions of power in Texas than anyone before or since. She recognized what it meant to be part of an under-represented group and she struggled heroically to change that. I'm very proud of the fact that in 1990 I often wore a T-shirt that said, "Another man for Ann." It may be that John McCain and Bob Dole can't generate the outrage over a looming genocide in Darfur necessary to prompt the international community to act, but perhaps Nobel laureate and Holocaust survivor Elie Wiesel can, with the help of actor George Clooney. Both spoke today to members of the United Nations Security Council. Clooney, who traveled to Darfur in April with his father, journalist Nick Clooney, told members of the Security Council, "After September 30, you won't need the U.N. You will simply need men with shovels and bleached white linen and headstones." The Sudanese government is resisting plans to insert a UN peacekeeping force in Darfur on October 1 to replace the African Union troops who will be withdrawn then. Sunday, September 17, is the "Global Day for Darfur." Check here to see if there's an event near you. There have been international treaties to control the spread of nuclear, chemical and biological weapons for decades. Yet, despite the mounting death toll, there is still no treaty governing sales of all conventional weapons from handguns to attack helicopters. As a result, weapons fall into the wrong hands all too easily, fuelling human rights abuses, prolonging wars and digging countries deeper into poverty. This is allowed to continue because of the complicity of governments, especially rich countries' governments, which turn a blind eye to the appalling human suffering associated with the proliferation of weapons. Every year, small arms alone kill more people than the atomic bombs dropped on Hiroshima and Nagasaki put together. Many more people are injured, terrorised or driven from their homes by armed violence. The United Nations General Assembly will soon consider a resolution designed to lay the groundwork for an Arms Trade Treaty. In its present form, the proposed Arms Trade Treaty would make it illegal to sell weapons in cases where doing so would facilitate violations of international law. Notwithstanding its simple and relatively benign provisions, the United States will almost certainly oppose the treaty when and if it comes into existence. Why? Ask the NRA. James Carroll reaches for the transcendent in his reflections on 9/11 while an unsigned editorial in the New York Times argues that we have compounded the tragedy of 9/11 through our government's failure to ask for the sacrifices that Americans were ready to make after the World Trade Center fell. All of us want to find meaning in the events of 9/11. The tragedy of the post-9/11 era, however, lies in the fact that our own government also generated considerable fear. It was, in fact, politically expedient for it to do so. The outrage is that our government did so using information that we now know to have been false in case after case. The very government charged with making us more secure generated great insecurity. And it color-coded our level of insecurity for good measure. Terrorist acts can be thwarted and terrorists can be undercut by starving them of the support they need from their societies. But a "global war on terrorism" is an altogether different matter. It is akin to fighting a fire with gasoline. A different strategy is available and it needs to be implemented. We know that absolute security is an impossibility. It always has been. But absolute security is not what anyone is asking for. Instead, we simply need a respite from rhetoric that focuses on fear and a reversal of those policies that have actually increased our insecurity. As with Srebrenica in 1995, the potential for further mass killing in Darfur today is plain for all to see. All the warnings have been issued, including one from the United Nations that the coming weeks may see "a man-made catastrophe of an unprecedented scale." What remains unclear is only whether the world has the will to impose an outcome on Sudan different from that which unfolded so tragically in Bosnia. Make no mistake: At some point we will step in to help victims in Darfur and police an eventual settlement. The question is whether the United States and other nations will act now to prevent a tragedy, or merely express sorrow and act later to deal with its aftermath. As Samantha Power has noted, "Genocide has occurred so often and so uncontested in the last fifty years that an epithet more apt in describing recent events than the oft-chanted 'Never Again' is in fact 'Again and Again.'" No one can say they didn't know what was happening this time. Declan Walsh, writing in the Guardian, traces the very cold trail of Osama bin Ladin. It's a long piece well worth reading. Imagine being expelled from your university for cutting class. A number of British universities, including Oxford, have introduced obligatory contracts to ensure the good--and even studious--behavior of undergraduate students. Chester University's contract, for example, includes the obligation to "study diligently, and to attend promptly and participate appropriately at lectures, courses, classes, seminars, tutorials, work placements and other activities which form part of the programme as required." The National Union of Students has complained that the contracts fail to include any obligation on the part of the universities requiring them to ensure that their classes are worth attending. As an editorial in tomorrow's edition of The Oxford Student notes, "If a contract is to bind students to attending lectures and tutorials, surely it should also bind the university to specifying levels of teaching provision." I'm with the students on this one. I'd hate to think that the only reason students were attending my class was their fear of being expelled from the university. Steve Clemons, who has followed Ambassador John Bolton's UN career more closely than anyone, reports that it is "highly unlikely" that the Senate Foreign Relations Committee will favorably report Bolton's nomination to the floor of the Senate. Bolton's chances of confirmation are, in other words, dead. Bolton, you may recall, was given a recess appointment by President Bush on August 1, 2005, after he failed to gain Senate confirmation on that occasion. Shortly before his most recent confirmation hearings began, a number of UN diplomats made their displeasure with Bolton public, too. On Wednesday, President Bush gave a major address in the East Room of the White House before families of 9/11 victims. In the speech, the President acknowledged that some suspected terrorists had been held and interrogated in secret locations, as the Washington Post first reported in November of last year. He announced that fourteen of these suspects, including Khalid Sheikh Mohammed and Ramzi bin al Shibh, both of whom are believed to have been among the masterminds of the 9/11 attacks, have been transferred to Guantanamo in preparation for trial. He also announced that he was sending to Congress a plan to create military tribunals that would comply with the Supreme Court's ruling in the case of Hamdan v. Rumsfeld. I've been intending to post something about this speech since first reading it Wednesday afternoon, but it has been difficult to find time to blog until now. So, with apologies for not being very timely, I'll offer a few comments here. First, some credit should be given to President Bush for shifting the frame away from the "war on terror" toward bringing criminals to justice. Six times in the speech the President spoke of bringing terrorists to justice. Of course, there were over a dozen references to the "war on terror," but this is progress nonetheless. More importantly, the desire to "bring those responsible for these crimes to justice" now seems to mean in the president's vernacular what it means to most of us: seeking convictions in an actual trial (although the legislation the president sent to Congress to remedy the defects that Hamdan found in the military tribunals appears seriously defective). Why is this a positive development? When President Bush has spoken of bringing terrorists to justice in the past, he has clearly had an expansive definition of what that might entail. For example, in the first presidential debate with John Kerry (on September 30, 2004), he said, "Of course we're after Saddam Hussein--I mean bin Laden. He's isolated. Seventy-five percent of his people have been brought to justice." The first four terrorism suspects tried by the United States under the system of military tribunals struck down in the Hamdan case were charged just six weeks before President Bush made this statement. (One of the suspects, in fact, was Salim Ahmed Hamdan.) None of the cases had been decided by the end of September. When the president spoke of bringing terrorists to justice in the presidential debate (and in other similar utterances), he was clearly talking about killing or "disappearing" them. It's important for Americans and others across the world to understand the kind of people held at Guantanamo. These aren't common criminals, or bystanders accidentally swept up on the battlefield--we have in place a rigorous process to ensure those held at Guantanamo Bay belong at Guantanamo. Those held at Guantanamo include suspected bomb makers, terrorist trainers, recruiters and facilitators, and potential suicide bombers. They are in our custody so they cannot murder our people. Unfortunately, there is more falsehood than truth in this statement. Many of the prisoners who have been brought to Guantanamo over the years have been released without charges. (In July 2005, the State Department reported that a total of 242 detainees had been released from Guantanamo. Some were released into the custody of other states, but those states in many instances freed their prisoners.) As I wrote in February of this year, a review of detainee records by the National Journal found that "contrary to frequent assertions that the prison at Guantanamo holds only the worst terrorists--those who would be killing Americans in Afghanistan or plotting the next 9/11 if freed--most are victims of mistaken identity or are, at worst, low-level Taliban or Al Qaeda soldiers with no knowledge of operational issues." I want to be absolutely clear with our people, and the world: The United States does not torture. It's against our laws, and it's against our values. I have not authorized it--and I will not authorize it. The problem here--as some pointed out when Condoleezza Rice went to Europe last December and said "the United States does not condone torture"--is that the Bush administration's definition of "torture" is, well, tortured. Not only has the United States used torture (by any reasonable definition of the term), it has almost certainly tortured Khalid Sheikh Mohammed, one of the individuals who was transferred to Guantanamo for trial. It's a good thing that President Bush has admitted the existence of the CIA's secret detention program, that "ghost detainees" have been transferred to a known location, and that trials may soon begin for some of those suspected of plotting the 9/11 attacks. What is not good is that we continue to hear some of the same old falsehoods from the President. Back on August 16th, Alexander L. George died at the age of 86. Professor George was one of most distinguished IR scholars of the late twentieth century. From 1968 until his retirement in 1990, he taught at Stanford where my colleague Dan Caldwell had the good fortune of studying with him and becoming his friend. Over the course of his long and productive career, Professor George published a number of influential and important works. In 1956, George and his wife, Juliette L. George, published Woodrow Wilson and Colonel House, a psychological biography of Wilson that has influenced all of Wilson's subsequent biographers. His 1975 work, Deterrence in American Foreign Policy, co-authored with Richard Smoke, won the Bancroft Prize for American History and Diplomacy. Force and Statecraft: Diplomatic Problems of Our Time, was co-authored with Gordon A. Craig back in 1983. A fourth edition prepared by Paul Gordon Lauren (who spent two weeks in residence at Pepperdine last spring) has just been published by Oxford University Press. There are many other noteworthy books left behind by Professor George: The Limits of Coercive Diplomacy, Forceful Persuasion: Coercive Diplomacy as an Alternative to War, and Bridging the Gap: Theory and Practice in American Foreign Policy, to name just a few more. Professor George's last book, published just over a month before he died, was On Foreign Policy: Unfinished Business. It is a discussion and summary of some of the research questions that Professor George hoped others would take up. I've been reading this slender volume this weekend. It is a book marked not only with the elegance and clarity characteristic of all of Professor George's writing but with a profound humility as well. I recall my mentor at the University of Virginia, Inis Claude, talking about the persistence and the importance of the "big questions" in international relations; the same awareness of the value of enduring questions pervades On Foreign Policy: Unfinished Business. As George noted in the Introduction (p. vii), "Typically what we report in our journals deals mainly with what we, and hopefully others, consider to be progress in developing knowledge and theories. Perhaps too seldom do our journals invite or publish articles that focus instead on important puzzles or gaps." As I have time over the next few days, I plan to discuss a few of the questions that Professor George left for us to ponder. For now, though, I want to suggest this distinction between the researcher and the teacher: We rightly judge the researcher by his or her contributions to some body of knowledge. That is, it is the answers left behind that are important. But we properly judge the teacher by a different standard, it seems to me. The teacher is judged by the questions he or she leaves for students to ponder. Professor George was clearly a great researcher and a great teacher. According to this post over at Opinio Juris, Japan may be joining the International Criminal Court next year. As Kevin Jon Heller notes, "Japan's membership would significantly increase the prestige of the Court and encourage other countries in Asia--currently the most under-represented region--to do likewise." Last week, noting the recovery of two Edvard Munch paintings by Norwegian police, I said that the buyers of stolen art are often other traffickers with more money than scruples. Not so fast, Williams. While that may be true, there have been a number of more reputable purchasers of purloined paintings and other ill-gotten cultural objects, one of whom is here in Malibu. This past week, two Greek artefacts went on display in the National Archeological Museum in Athens within hours of their arrival from Los Angeles. The antiquities were illegally removed from Greece and purchased by the J. Paul Getty Trust. Until recently, they were on display at the Getty Villa in Malibu. Tomorrow, Greece will recover a piece of marble from the Parthenon that has been held by Heidelberg University. This repatriation, combined with the return of objects by the Getty, may increase pressure on the British Museum to return the Elgin Marbles, which were removed from the Parthenon in 1810. Needless to say, the Greeks have long been upset at having lost their marbles. Attempts to explain the vehemence of anti-U.S. feeling abroad correctly home in on Iraq and other unpopular policies of the current administration. But over the past three decades the kudzu-like growth of another U.S. practice, used by Congress and by Democratic and Republican administrations alike, has nurtured seething resentment abroad. This is what might be called "foreign policy by report card," the issuing of public assessments of the performance of other countries, with the threat of economic or political sanctions for those whose performance, in our view, doesn't make the grade. The overuse of these mandated reports makes us seem judgmental, moralistic and bullying. Special 301 Report--Intellectual Property Rights Protection (Office of the U.S. Trade Representative). In addition, the United States monitors and in some instances imposes sanctions on countries that violate domestic or international norms regarding nuclear nonproliferation, labor rights, conflict diamonds, and sea turtle protection. our public reports have reinforced the view abroad that we set ourselves up unilaterally as police officer, judge and jury of other countries' conduct. Often, governments in developing countries in particular are committed to the objectives we are promoting, but they are overwhelmed by poverty, political instability and other existential problems that, in their view, dwarf the issues on which we would have them concentrate. Even so, they struggle to improve, say, performance on human trafficking, only to be found lacking with respect to drugs or labor rights. They may well conclude that, however much they try, their best is never good enough for us. The result is demoralization, anger and sullen resistance where we otherwise might have made common cause. We could adjust this approach, especially where the objectives enjoy broad support in the international community, to advance them through multilateral organizations. We have effectively promoted more vigorous action against money laundering through the broadly based Financial Action Task Force. Several years ago, and as resentment over our annual narcotics certification process threatened to spin out of control, Congress softened the approach and, with modest success, we sought to make the Western Hemisphere portion of it multilateral through the Organization of American States. Scaling back in other areas would help. It is critical, though, that we refrain from using this tool as we seek to promote new objectives--however worthy--in the future. The tolerance of other societies for being publicly judged by the United States has reached its limits. If you're not comfortable with the analogy to the classroom, then either you're not a fan of hegemonic stability theory or you just don't like thinking about grades. If it's the former, then take heart because there is a liberal internationalist response to the U.S. government's emphasis on assigning grades. Hamilton, in fact, presents it in his penultimate paragraph: In those instances "where the objectives enjoy broad support in the international community," it would be possible "to advance them through multilateral organizations" rather than through a unilateral system of grades and sanctions. The notorious Abu Ghraib prison has been transferred by the United States military to the Iraqi government, thus bringing to an end an episode representing one of the worst self-inflicted wounds in the U.S. occupation of Iraq. The Washington Post describes the transfer here. One of the most interesting bits of information provided by the Post story is buried in the last sentence. According to Lt. Col. Keir Kevin Curry, the U.S. Army's spokesman for detainee operations, there are currently about 13,000 detainees in coalition custody. I have been arguing since November 2001 that it is a mistake to label counter-terrorism efforts a "war on terrorism," that doing so serves political rather than strategic ends, and that the rhetoric of war unwisely elevates the status--especially in the Muslim world--of those whom we label our enemies. Others have made similar arguments. But let us suppose, for a moment, that "war" is the proper frame through which to consider our efforts to deal with terrorism. Where are we winning in this "war"? Iraq is a disaster. The United States is trying, without success, to secure Baghdad by abandoning military missions in other parts of the country. According to the Pentagon, three thousands Iraqis are being killed or wounded each month. President Bush and others continue to argue that the United States must not withdraw from Iraq, but, significantly, administration officials are no longer trying to convince Americans that there is good news from Iraq that, inexplicably, is just not being reported. But there's Afghanistan, right? While the Taliban was ousted from power almost five years ago, there are disturbing signs that Afghanistan is not the success story we were told it was. The New York Times reports that Afghanistan's opium harvest has reached record levels, in part because of the Taliban's resurgence in the southern part of the country. The Taliban is encouraging local farmers to grow more poppies, and they are. They're growing so many more poppies, in fact, that Afghanistan's production is now 30 percent higher than necessary to support worldwide consumption of heroin, which is the primary derivative of the crop. Al Qaeda has, of course, been displaced from its former base in Afghanistan, but it's still possible (if not popular with the administration) to ask, "Where's Osama?" Two years ago, some experts were beginning to wonder if the threat Al Qaeda represented was beginning to metastasize as copycat organizations appeared all over the world and carried out attacks with direction or support from the original Al Qaeda. Now there is no doubt that that is what has happened. The news on the counter-terrorism front is not all bad. Some plots have been foiled and some who were planning terrorist acts have been arrested. But these successes rarely seem to bear any relationship to the wars we are fighting in Iraq and Afghanistan or to the one some seem to be contemplating in Iran. If we're really in a war, then we may need to begin asking some difficult questions about how it's going. 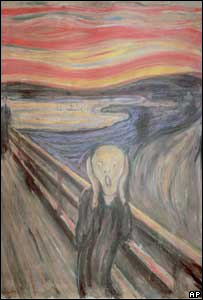 Two years after it was stolen from the Munch Museum in Oslo, Edvard Munch's The Scream was recovered earlier this week by Norwegian police. Contrary to the expectations of many experts, the thieves, three of whom were arrested, were not college students looking for art for their dorm room walls. Stolen art may not be as fungible as drugs or weapons, but it is nonetheless a significant part of the world's vast underground economy. When stolen art is sold, the buyers are often drug traffickers or arms dealers who have vast sums of money to spend and no scruples about trading with other traffickers. It's enough to make you want to . . . visit an art museum while the most famous works are still on display. Or maybe just scream. The government generally releases bad news on a Friday afternoon. Really bad news is released on the Friday afternoon of a three-day weekend. Iraqi casualties soared by more than 50 percent during the roughly three-month period ending in early August, the product of spiraling sectarian clashes and a Sunni-based insurgency that remains "potent and viable," the Pentagon noted today in a comprehensive assessment of security in Iraq. Meanwhile, President Bush, Vice President Cheney, and Secretary of Defense Rumsfeld have been trying to frame the conflict in Iraq as the twenty-first-century equivalent of earlier struggles against fascism. It would be helpful, assuming that's what we're going to be hearing over and over again between now and the mid-term elections, if the administration would also put forward a plan for winning this war. "Stay the course" is no plan at all when the course is as disastrous as the one described in the Pentagon's report.